A couple weeks ago, in Nashua, NH for work, I discovered the perfect appetizer. It's about time, right? A variation on the seriously awesome grits and pork belly appetizer I had with house made hot sauce and sunny side up egg at the Apple Pie Cafe at the Culinary Institute a couple years ago, the bacon and eggs at MT's Local Kitchen and Wine Bar has captured the crown. I wish they had seated us closer to a window so I could give you a better look at this masterpiece of comfort: crispy pork belly with the perfect ratio of tender fat to chewy meat, deep fried egg with still-runny yolk, dense, creamy grits, and a little dried apricot compote. 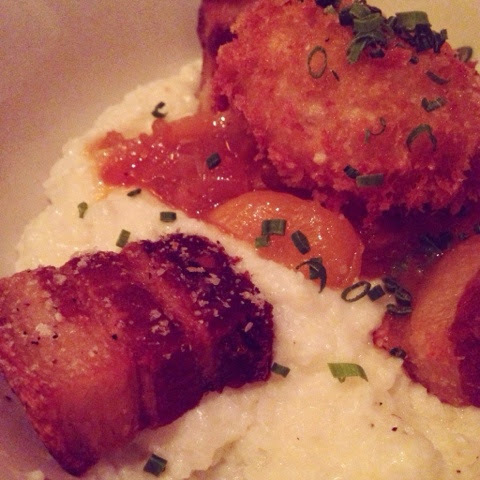 The grits might not have passed muster with a true GRITS (girl raised in the south), but this Yankee was thrilled with the hearty grind of the corn, the perfect, balanced selenity of the pork, the rich egg yolk, and the sweet, musky funk of the apricots. If I had my own restaurant, a variation of this dish would be on the menu, and it's something I wish I could get around these parts, because it's all the things, for me, that make perfect comfort food. MT's Local, right on Nashua's little Main Street/downtown area, is decorated in soothing colors and cool art. In fact, the watercolors of churches in the ladies room were so cool, I had a fleeting impulse to abscond with one. But I have to say, while our meal was good, that appetizer really was the highlight of the meal. There were a couple other good bites that you should know about, though, as overall, this was one of the brighter spots in the Nasua culinary scene that I've experienced. 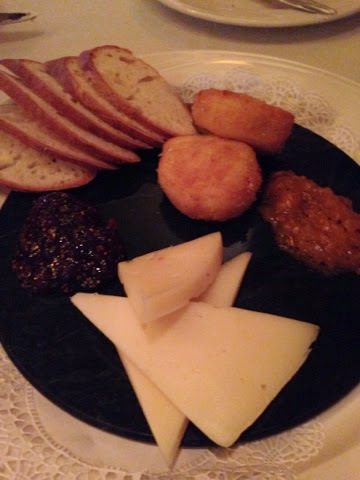 The cheese plate came complete with fried discs of tangy, ripe, creamy goat cheese - given the side eye by our more conservative eaters and gobbled up by those of us on the more adventurous side. I also enjoyed the rather spicy apricot jam on this plate - Mr. MT knows what he's doing with apricots, you guys! It was sweet and tangy, pairs well with the funk of the goat cheese. 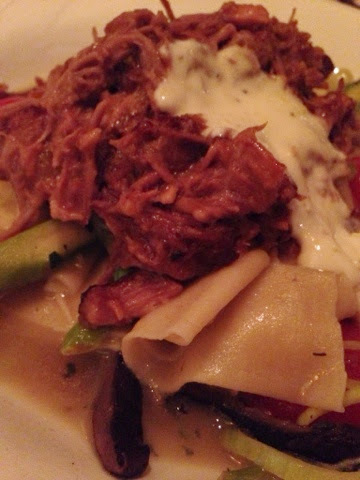 I ordered the white wine braised pork with pappardelle for my entree, and eagerly anticipated its treasures after that fabulous pork belly and grits appetizer - but the pasta was a bit gluey. I liked the light, lemony flavor of the dish overall, but a finishing sprinkle of sea salt or a shower of pungent Romano cheese would have gone a tremendous way in helping amp up the flavor. The braised duck with gnocchi and ricotta was the winning entree of the table. Lucky Shannon for ordering this gem! The duck was lush, deep, savory incarnate. Pick this if you hit up MT's. Liz went for the special, which was fried chicken. And it WAS special! 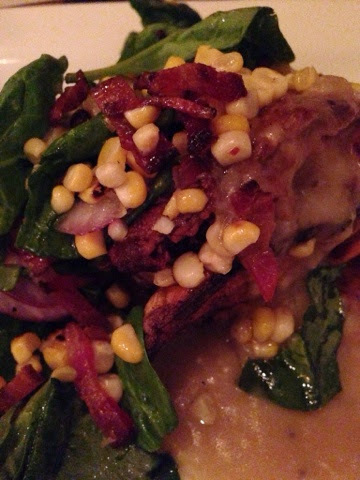 I loved the dark meat, with its succulent crust and a little moat of delectable, rich, homemade gravy. Home style is done correctly here. An odd little menu tick stuck out to us and we asked the waitress to bring us a sample: crispy ham croutons, which were listed as an ingredient in the field salad. Joke's on us! 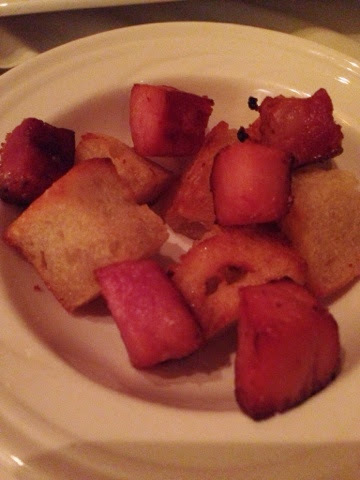 Rather than the homemade pork rinds I was imagining, these were crispy cubes of bread, and large cubes of ham. Separate - not a crouton made of ham, but ham AND croutons. Wah-wah. We sampled some desserts, but they didn't really toot my horn. I think that appetizer was so ooey gooey good, I only had eyes for it. We all chatted and gave MT's a seven on the BHS scale - there were some great dishes and some problematic ones, but lovely, warm ambiance, fab drinks (order the It's Me Time! ), and good company. Keep it on your list, order the duck, and snag me a watercolor, will ya? My personality is big, my hunger is bigger! Once upon a time, Oneonta, NY was the home of the largest railroad union in the world. That is an area of little interest to me, but because of that heritage, there is now a restaurant in cutie pie downtown Oneonta called the Red Caboose. As you can imagine, I'm rather interested in that, so on the way to New Hampshire last week for work, I convinced the ladies to stop there for lunch. 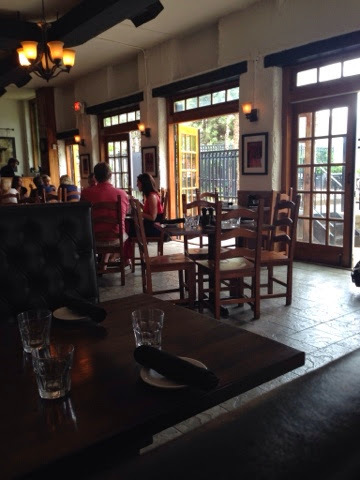 Situated right on the main drag downtown, The Red Caboose's feel is of a railroad station in the Tuscan countryside. 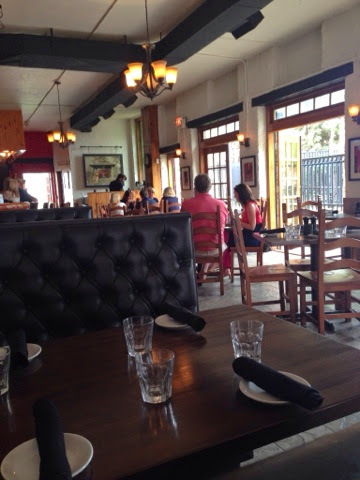 I loved the paned French doors overlooking the patio, and the rustic wooden plates upon which our robust lunches were presented. The friendly, handsome wait staff didn't hurt, either. This was a welcome respite from our work-induced road trip. 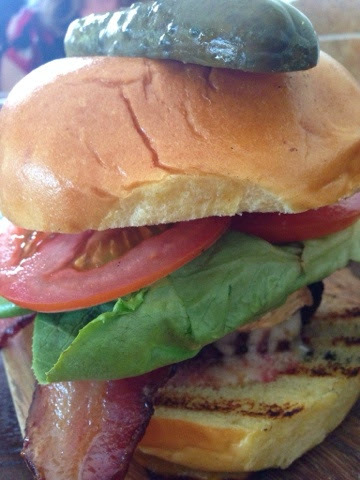 I was eyeing the burgers to begin with, but once our waiter described that day's special - a black pepper camembert-topped beef burger from Kilcoyne Frams in Brasher Falls, with applewood smoked bacon...I was all in. Thank goodness for my enthusiastic nature, because that thing was good. Like, smoky, deep, umami juices exploding all over my hands upon the first bite good. 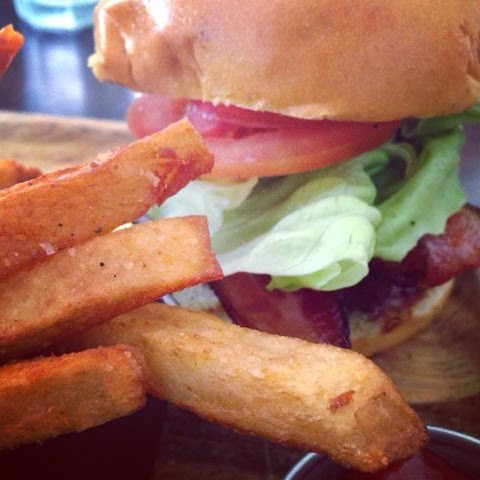 The kind of burger it's OK not to track in your Weight Watchers app. The kind of burger you lie about to your partner. I'm not kidding, you guys. Go get a burger in Oneonta! 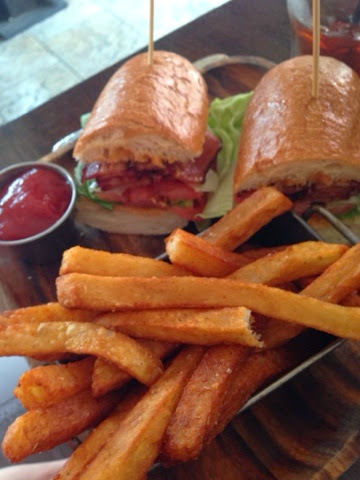 Of course there were fries on the side, and not terribly surprisingly, they were resplendent. Hand cut, of course, and thick. Pillowy and fluffy inside, delicately crisp outside, with the perfect "fry" flavor of potato and fried food. We all loved them. See that flaky salt on the fry, right there? That's te signature of a chef who understands the art of the French fry. Red Caboose is a farm to table joint, sourcing a lot of their product right in New York State, and that flake of salt right there is exhibit A in the prosecution's assertion that this guy is real deal. It is sticking to the fry because he sprinkled it as soon as the spuds left the hot oil, which is prime time to season your fried food. Well done, sir. 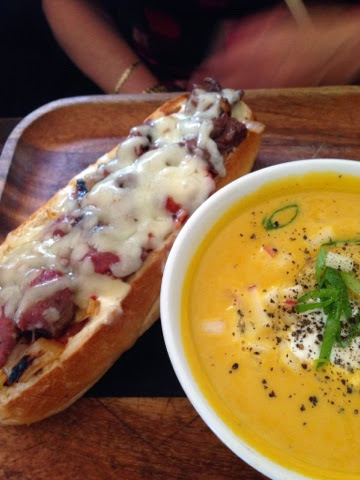 Theresa ordered the steak sandwich and butternut squash soup. Her sandwich looked divine, but I didn't taste it. I DID sneak a spoonful of the soup, which was subtly spiced with curry, light and not too sweet or overly creamy. I believe they use ricotta rather than heavy cream, which is wise. So many squash soup are too sweet, but I loved this one's complexity. 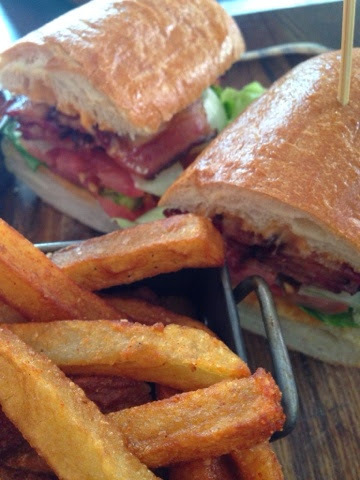 Kelly went for a ginormous BLT and scarfed that sucker down. It looked phenomenal, and I wouldn't have dared to ask her to spare a bite. I care too much! I already want to go back. Anyone up for a jaunt to Oneonta? I want the scallops with pork belly (obvi) and the gnocchi with mushrooms, plus a dive into their great cocktail menu. I kind of want them right now. I'm awarding the Red Caboose an eight on the BHS scale, and this may be the new official stop for us on all trips to NH. Four out of four colleagues agree! My personality is big; my hunger is bigger! I have long griped, publicly and loudly, that while there are a wealth of restaurants celebrating the Italian culinary heritage of the Triple Cities, the Eastern European food is just not getting enough representation. 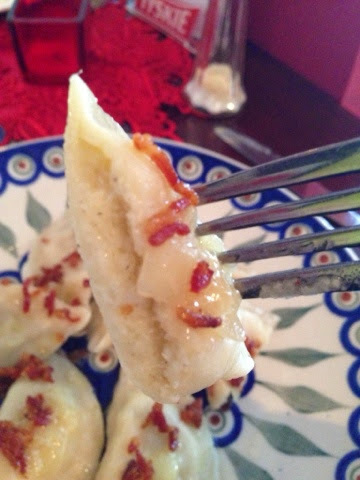 I can't figure out why creative, modern takes on pierogi aren't rocking several area menus. Podlasie, in Endicott, is not taking a creative or modern approach to Polish cuisine. But you know what, who cares? Because this unassuming, warm but spare eatery on 17C, just up the road from the Glendale complex is kicking it old school with soul-warming, earthy, homey food that will make you wonder why you haven't eaten here yet. The restaurant is immaculate, painted in welcoming reds and yellows, and perfectly laid back, with friendly, casual service. You've gotta go! I ordered this very suspiciously colored Polish soda to accompany my lunch and while the hue was a bit scary, the sort of anonymous, sweet, fruit punch flavor was good. 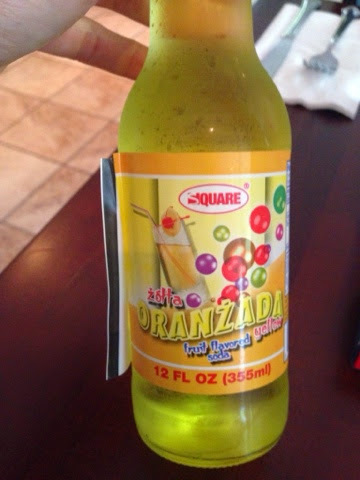 If I ever go to Poland, at least I'll know to drink Oranzada! Podlaise always touts their homemade soups on their Facebook page, so I made sure to order the du jour. 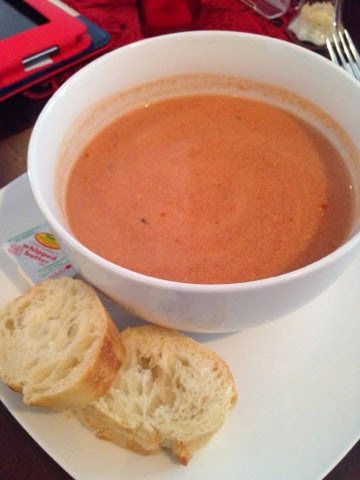 The tomato and rice soup was served in a large bowl, and was very well flavored through, though thinner than I would have expected from homemade cream of tomato soup. I suspect a good amount of tomato paste was the source of the deep flavor, and the perfectly cooked long grain white rice was a pleasant surprise - rice in soups is so often overcooked and flabby. Little rounds of French bread were served on the side. I think it would have been cool to have these toasted and buttered and floating on top, but that's just me trying to modernize something that's intentionally simple and traditional. Shame on me! I quite liked this taste of childhood, though we ate Campbell's in our house, and this was way better. I was merrily slurping soup and splattering it all over my glasses. I didn't mind one bit. Just then, a very cute young cook came out to check how I liked the soup, and admitted that he had burnt my bread, sheepishly. No biggie, because about two minutes later, my also cute waitress delivered a new batch. It was softer, and warm deliciously through. The goodness of it surprised me. It was everything white bread should be: airy, golden on the outside, a pinch of salt in there giving the crumb just enough personality, and the wholesome goodness of your childhood singing through. I know I keep hearkening back to childhood, and I apologize, but this was just such honest, clean, home style food. Is there a tiny Polish child living inside me and I don't know it? Is that creepy? Ok, enough with creepy conjoined Polish twins! 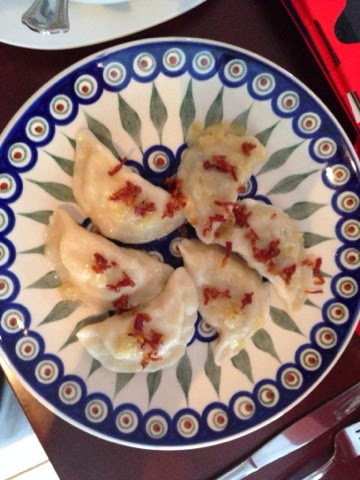 Let's get to the pierogi! I chose a combo of the traditional potato and cheese and the sauerkraut with mushrooms. And when Cute Cook popped out to ask me if I wanted bacon on top, I giggled and said yes. I mean, duh. 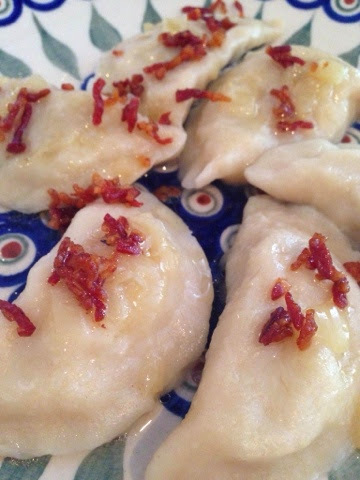 The pierogi at Podlasie are delicate and glistening, with highly rendered, almost crystallized bacon on top. You can taste the russet potato inside, mild farmers cheese surrendering to the earthy, comforting spud. The dough is tender in a way that betrays someone working it by hand, just enough to make it smooth and elastic enough to withstand the cooking process without too great a thickness or any hint of over-developed gluten. The bits of onion cooked down in the butter dousing the plate are like candy. But it's not too much butter - none of these babies are drowning today. The sauerkraut dumplings also are sweet, with none of the commercial, canned flavor you so often get in the kraut. This is made in house, simply, from scratch, from a recipe handed down by someone who cares about sauerkraut. Does that make sense? You can taste the love and the comfort built in. It's mild and sweet, finely shredded, and utterly, gorgeously delicious. The mushrooms are in there, but subtle. The potato perogies are homey, but these are the main event. Don't miss them. Basically, while I was putting down this entire plate of dumpling goodness, I was thinking that I might marry one of the sauerkraut pierogi. Cute Cook can be the ring bearer at the wedding, maybe? 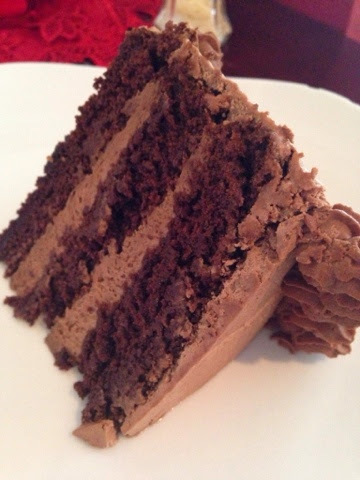 I was sad they were out of the chocolate babka the day I was there, but the chocolate cake is iced with chocolate mousse, and rather than be too sweet or too rich, it was dense and deep in a cocoa-enriched way. Just perfect. So I think it's alllllll going to be alright. Look, I only ate a few things here. One lunch probably shouldn't merit such praise. But I really, really liked this food. I kind of want to give it a nine on the BHS scale. Is that crazy? But between Cute Cook being all attentive and asking me if I wanted bacon, and how clean it was in there, and those freaking delicious, tender, precious pierogi - I think I'm in love. You guys totally have to check this place out. The menu is limited, and it's small, but so inviting and just simply good. Please go, and then report back in, ok? Promise me! It's not often I devote a post to revisits. In my book, once I like a place, I like it. Once I hate it, I'm not going back, period. If a restaurant can't deliver on service, taste, ambiance, or value the first time, it's not likey to in the future. But I've done it before and I'll do it again - I break my own rules with this blog. The past couple weeks have included lots of old favorites, some that have disappointed and some that have surprised and shone. Let's take a look! 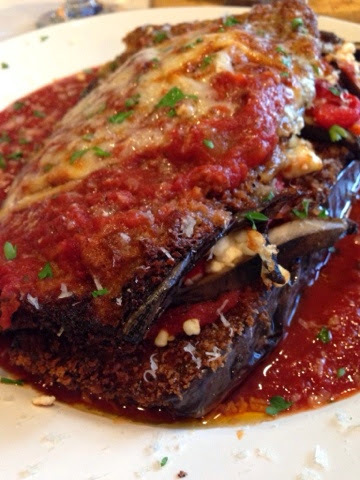 Pete's Trattoria - Watertown: I had the eggplant napolean and very much liked it, although it wasn't, like, the most amazing eggplant dish ever. I liked the crunchy fried coating on the eggplant steak, but felt the vegetable could have been sliced thinner for a sweeter end product. The tomato sauce was hearty and homey, rich and sweet. But it was light and satisfying at the same time, and is was a happy camper. I also enjoyed the soup that night, a pork BBQ creation bursting with fresh corn, and warm spices. Unfortunately, Mom's homemade pasta and meatballs were vastly less successful. She reported that the pasta was gummy and old tasting, and the meatballs dry. Moreover, service was a disaster, our waitress disappearing for long stretches of time, with almost a 20 minute wait for the check when we were ready to leave. I can't imagine what to attribute these shortcomings to - I've loved Pete's the other three or four times I've been there since the new management took over - but I hope some resolution is on deck. Gram's Diner - Adams: more delicious food, more good service. This place is one of my new favorites in the North country. 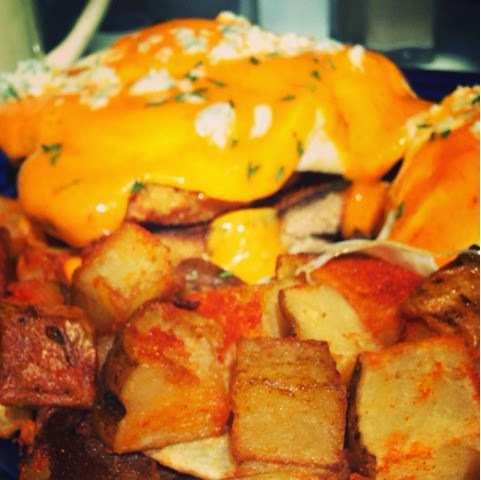 This time, I enjoyed another quirky and inventive brunch special: buffalo chicken eggs Benedict. Think crunchy fried chicken cutlets and perfectly poached, delicate eggs with a creamy, hot-sauce spiked holland aisle sauce and blue cheese crumbles. I'm not kidding, it was awesomely delicious. Channelside - Clayton: We ate here just last weekend, my parents, some family friends, and moi. Natch, the setting was beyond. You can't complain about The River. Unlike the last time we ate there, late night last August, our service was friendly and prompt. And I was pleased that there are some new, slightly more creative options on the updated menu, like a burger made with half beef and half bacon, and poutine. But the increase in creativity seems to have come at the expense of the cooking itself. I ordered that poutine and that 50/50 burger. 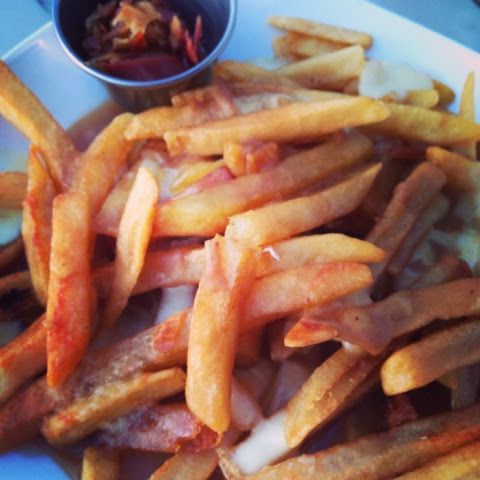 The fries, gravy, and cheese curds were exceedingly one-note, and while the menu touted house cut fries, these were freezer-born. You cannot fool me on fries! And my burger? I tasted nary a morsel of bacon,though the beef was juicy - again, this was ok. But just ok. This place will always do well, because it has a prime location and most people are ok with ok. Hey Channelside! You've got the view, you've got that gorgeous bar, but I want more! Loft at 99 - Binghamton: I hadn't been back at this downtown gem since the management changed. I had heard mixed reviews through the Southern Tier grapevine, and getting back to try it myself just never seemed like a priority. Well, someone needs to rethink her priorities! Melinda and I popped in a couple weeks ago for cocktails and snacks one evening, and it knocked my socks off! We had pisco sours, a Peruvian drink utilizing that country's liquor of choice, pisco, as well as lime, egg whites, bitters, and a smidge of sugar. These were delectable - creamy, tart little glasses of happy. 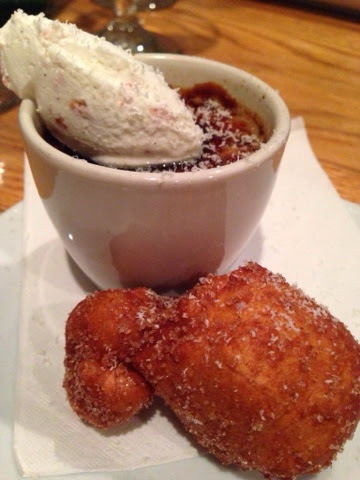 Small plates of bitterballen or meatballs, and chicken wings, were simple but perfect, and the dessert I had, mixing a small, chocolate Creme brûlée with tiny, sugar-dusted beignets and bacon whipped cream was genius. It wasn't perfect - the brûlée was a little coarse and the beignet was a tad tough, but the exemplary, attentive, cheerful service and check-in from the manager more than made up for minute culinary speed bumps. I'm smitten anew. South Fin Grill - Staten Island: this oldie is still a goodie. 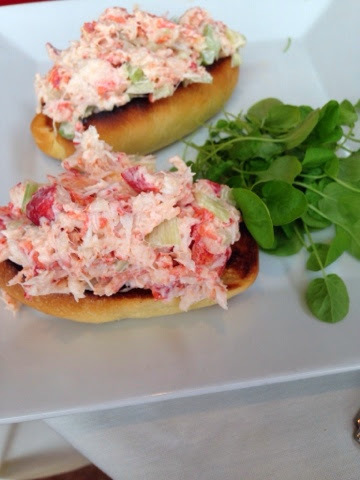 We squeezed in a sunny, decadent lunch here during miss New York weekend, and are grateful for another chance to gorge ourselves on South Fin's epic miniature lobster rolls. This place is a don't miss in SI. Enoteca Maria - Staten Island: Yeah, I know I just reviewed this joint. Don't judge - the folks we were down in SI with were completely jazzed to eat here. And since we loved it, why would we argue? Our second meal was just as enjoyable as the first, and this time, our nonna brought us a gorgeous little salad of fennel, red seedless grapes, oranges, and honeydew melon that I am now obsessed with. 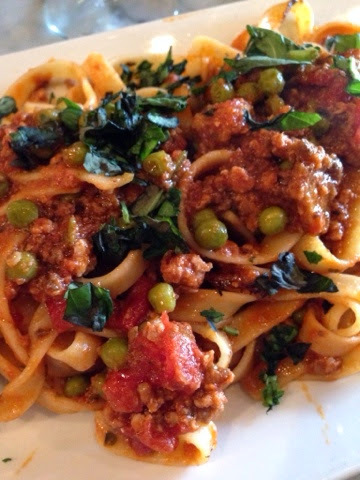 I had fettuccine in ragu, and it was probably the best, most rustic and thoroughly flavorful meat sauce I have ever had, with an incredible balance of flavors - and peas! I love peas. God bless nonna. So those are my updates, folks. I'm back up in New Hampshire next week for work, so look for a new dispatch from a Nashuanian restaurant I picked for our department dinner. And I'm home in Owego all this weekend, so if you want to grab a bite, let me know! My personality is big, my hunger is bigger!